Okay guys. It is gonna cost us £450 to get the transcripts we need NOT £15,000. It is still a lot of money. A friend who is fighting HBOS in a different manner came up with the idea of trying to get 450 people to donate a £1. Another friend came up with the idea of trying to get 45 people to donate £10. 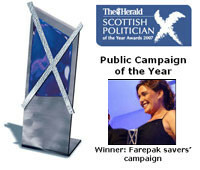 I am thinking MP's, MSP's Welsh Assembly members who have all shouted out about Farepak and HBOS - would they help us? Would they donate £10 each so that we can get these transcripts????? I will quite happily draft letter/email for us to send to our respective MP's asking them to continue to support our cause and HBOS need to be investigated so we need those transcripts! We could pitch our requirements here?????? Accordingly, we are asking anyone who feels inclined to help us continue the fight for justice, to support us in our quest to obtain these transcripts which may help to further highlight potentially illicit activity at HBOS. We need as many people as possible to donate £1 (or more) to our PayPal account info@unfairpak.co.uk in order to obtain the transcripts and give us a fighting fund to investigate HBOS’s role further. We might even be able to get legal advice on how to proceed. We will keep a running account of what is received and how it is disbursed, on the Unfairpak site http://www.unfairpak.co.uk/ . REPLY REGARDING FOI - IT'S A NO GO BUT THE APPEAL IS DOING WELL!!! Your request has been passed to me because I have responsibility for answering requests, which relate to Her Majesty’s Courts and Tribunals Service and is being handled under the Freedom of Information Act 2000 (FOIA). We are not obliged to provide information contained in a court record. In this case, the information you are seeking is contained in any document created by a court (section 32 (1) of the Act). You can find out more about Section 32 by reading the extract from the Act and some guidance points we consider when applying this exemption, attached at the end of this letter. We are also not obliged under section 40(2) of the Act to provide information that is the personal information of another person if releasing it would contravene any of the provisions in the Data Protection Act 1998 (DPA), for example if disclosure is unfair. You can also find more information by reading the full text of the Act (available at http://www.legislation.gov.uk/ukpga/2000/36/section/40) and further guidance http://www.justice.gov.uk/guidance/foi- ... idance.htm. Just to update - we are going after ALL the transcripts now!